The Laboratory of Pressure realizes the unit of pressure (Pa) through the use of pressure balances. The latter are essentially pressure generating devices, in which the vertical upward force generated by the hydrostatic pressure to be measured, is balanced by the downward weight of a number of masses, acting upon a piston of accurately known surface, which moves freely within a cylinder. The Laboratory has available 7 reference piston/cylinder assemblies, which use pure nitrogen or sebacate oil as pressure medium and cover the range -100 kPa to 140 MPa in gauge mode and up to 7 MPa in absolute mode, with relative uncertainties 35 to 100 ppm. Measurements are traceable to the German National Standards (PTB). 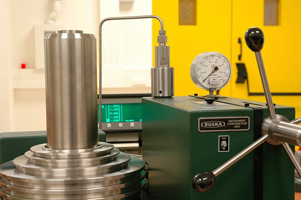 Additionally, the Laboratory can carry out traceable low pressure/vacuum measurements in the range 100 kPa to 1×10-8 hPa, with relative uncertainties ranging from 0,5% to 10%, through the use of a vacuum calibration system and appropriate vacuum gauge reference standards.